Ironman training isn't easy. Combining swimming, biking and running with a full time job and a family takes a lot of dedication from the athlete and tolerance from your loved ones. This year has been no different. In order to keep my family balance in check I have been very selfish and it was a rare occasion for me to train with others, it just doesn’t work, waiting around for people and finding a suitable time for all parties is difficult and often results in the loss of precious time I could spend with my kids. I usually train very early in the morning and since I work shifts I do the bulk of my training during weekdays, preferably when my daughters are at school/nursery, or still in bed. Long distance running and triathlon is what I love and I’m willing to make sacrifices to keep my passion going. Swim - swimming has never been my forte, I don’t remember how I learned the front crawl as a kid, I never attended swimming classes when I was young and I'm not passionate about swimming, although I do enjoy swimming in open water these days. To make the most of my limited time this year and make it more interesting, I have decided to follow a pattern in my swim training which went like this: technique drills swim, speed intervals/time trials swim and long swims. Most weeks I could manage 3 swims, sometimes 2 and on the rare occasion 4. I also decided to read a bit more on the subject and got a copy of Swim Smooth, which is the methodology used by British Triathlon as well as my Tri Club, a really great read. The combination of the reading plus my swim training pattern gave me a new focus on what I do in the water and I looked forward to swim sessions more than in the past. For Ironman Sweden this year I opted to start with the slightly faster group so that I could draft other athletes. A tactic I believe has helped to achieve my swim time of 1h17. Despite the swim being held in the Baltic Sea, the water felt warm and before I realised it I was in T1. Bike - I feel that the bike section offers the best dividends in terms of your finishing time in an Ironman. I'm not the best cyclist out there and this year my plan was to heavily invest my time in cycling in the hope of a breakthrough. Looking through my weekly training schedules this past week I can see I consistently spent 10 to 12 hours a week cycling. Training doesn’t have to be complicated and most weeks the training sessions were the same, what changed was the amount of time I cycled, the number of intervals I did, or the recovery period given in between sets. I have to thank my friends Harvey and Paul who gave invaluable advice and tips on bike training during this time. I am a big fan of power meters for triathlon racing and training and to monitor my progress I routinely tested my functional threshold power (FTP). My wattage steadily improved over the weeks and months, my time trials were also very consistent and riding at Ironman wattage seemed comfortable during my long rides as I got closer to race day. In comparison to last year, (when I did my first Ironman in Austria) I started Ironman Sweden this year with a significant increase in my power budget. Progress had been made and I had high hopes for this race. My strategy for the bike race was as follows: to pedal smoothly with high cadence, without spikes in power and spend as much time as I could close to my self-selected power output budget. Well, it's easier said than done and in practice I opted to do this at 1hour-laps, whereby after each hour I'd press lap on my bike computer and spend a couple of minutes stretching my back and eating before I was ready to concentrate again. I managed 4 x 1 hour laps doing this and for the remainder of the bike portion I got out of the aero position more often as my back had started to ache. Looking through my bike data at the time, I saw my normalized power (NP) was exactly my budget of watts for the day and my average cadence was also high as I'd planned. Despite my sore back I was confident I was in for a good marathon. Cycling has definitely grown on me in the last few years and despite making progress this season I think there is a lot more I can improve and this excites me. My bike split was 5:52 in Sweden. During the bike portion I consumed just over 100 calories per hour, I used Generation UCAN, Nakd bars, water and salt sticks. T2 here we come. Running - Since completing the Thames Path 100 miles ultra earlier this year, my running has gone from strength to strength. Yet, whenever I felt a niggle coming or excessive fatigue, running would be the first one to be dropped in training. For Ironman Sweden I did a mixture of hill training intervals, long runs and long runs with Ironman pace, miles reps as the race approached and brick sessions. For nearly a year now I have been using the Maffetone method and training with a heart rate monitor, I have made great progress in terms of pace at a given heart rate since, for Ironman Sweden I had decided to run at a pace that coincided with roughly the top of my aerobic ability according to Dr. Maffetone, as this felt fast yet comfortable. When I left T2 I set into a pace of 8min/mile, I set my watch to beep every mile and I consistently got in the range of 7:55/8.10s. My back felt great and I was in high spirits with favourable weather conditions for running. It was great seeing my family every time I got back to the centre of Kalmar on each of the laps of the run course. By the time I got to mile 17 I felt cramps starting in both my calves, I had been consuming electrolytes and salt sticks throughout the race so my initial thought was that fatigue and overworked muscles just weren't capable to keep up that sort of pace. Cramps came and went until mile 22 and I managed to clock 8.40s miles during that time. The last four miles were tough as the cramps became more permanent. It's funny to remember, but it was very difficult to try making calculations, especially when I was in pain, it just doesn’t work, but all I thought was that if I could tick each mile at sub 9min/mile I would reach my dream goal of sub 11. I remember ticking 8:45s each mile and starting to dream of the finish line. I normally enjoy picking up the pace in the run up to the finish line but in Sweden I just couldn’t. I had given my all in that marathon. The last few hundred meters were emotional; you do feel like a rock star finishing an Ironman with the crowds and the red carpet. There it was, I was an Ironman again. I was super pleased with my marathon time of 3:38, only a few years ago I would dream of running a solo marathon at this speed, never mind after swimming 3.8k and cycling 180k beforehand. Nutrition wise, I consumed just under 100 calories per hour during the marathon, a mixture of Generation UCAN, High5 Isogels and a bit of flat coke, as well as water and salt sticks. Nutrition - the last few months I’ve been writing all these long blogs on metabolic efficiency (ME) and its benefits and during a big race like this I just wasn’t going to mess up my race nutrition. Overall I consumed less than 100 calories per hour during Ironman Sweden, yet I didn’t bonk / hit the wall, or suffer from any GI discomfort and I saved precious time by not stopping/slowing down in the majority of the aid stations. When you race and eat, both your muscles and digestive system are competing for oxygen-rich blood, so if you can tap into your own fat stores by working on your metabolic efficiency you will spare that blood for your working muscles, it’s that simple yet so elegant. Metabolic efficiency works without a doubt. Did I do the traditional carbload 3 days before the race? Nope, the only thing I did was to eat some good sources of carbohydrates (a bit of sweet potato, UCAN and couscous ) the day before the race to simply restore my carbohydrate stores. 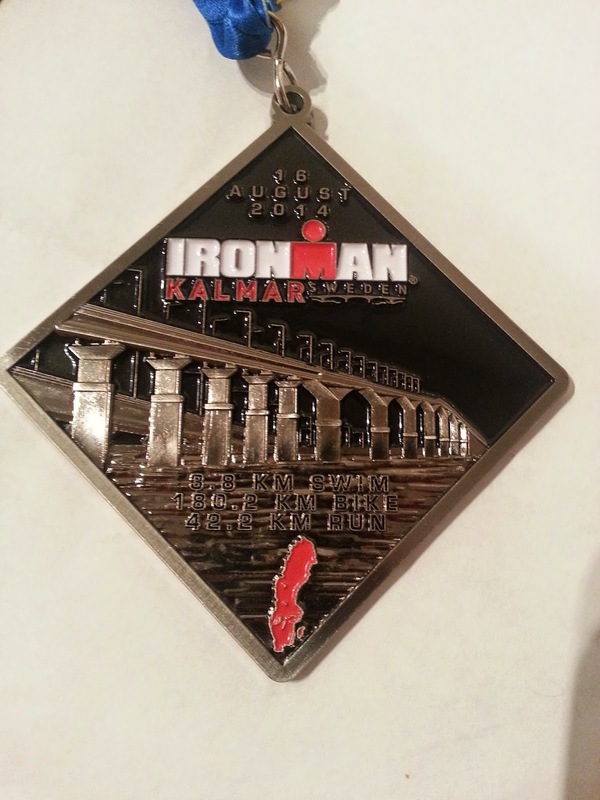 Overall I finished Ironman Kalmar in Sweden in 10:57. An Ironman Personal Best for me and mission accomplished, all on less than 100 calories per hour. 2014 has been perfect so far and I have one more goal later in Oct when I'll be competing in the Winter 100, a 100 miles ultra along the Ridgeway and Thames Path. I am really looking forward to it! Sleep, sleep and sleep: unless you are a professional athlete, you won’t have the time to sit around and rest after training sessions, so the bulk of your recovery will be done when you sleep. Your favourite football team is no longer important when you badly want to achieve your goals. Switch the telly off and zzzzzzzz! Be selfish with your training time. Training with friends is great but you normally end up going too fast or too slow defeating the purpose of your training. Unless you are in charge of the session leave group sessions for the off-season. And last but not least, get yourself metabolic efficient! No brainer! Brilliant race report!! And oh my goodness - a 3:38 marathon after all that swimming and cycling! I'm in awe!! Absolutely BRILLIANT!!! Beautiful race report. I'm doing Kalmar 2016 as my first IM so reading this helped out quite a bit. Especially the metabolic efficiency part. I finished my first 70.3 a couple of weeks back with no carb loading since my body is fat adapted from around 6-8 months of low carb high fat eating. Thanks again for the recollection of the day. Great to hear. I have fond memories of Kalmar. Thanks for reading the blog.